The Labour Party and particularly Jeremy Corbyn have tried to make political capital out of a homeless man who was found dead at Westminster tube station last week. Much of the Labour Party and media rhetoric was directed at the government and social services for failing to provide sufficient homes for these poor homeless people. 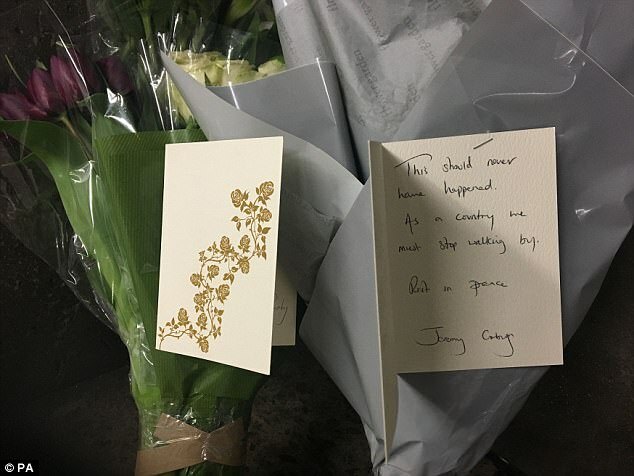 Jeremy Corbyn laid flowers at the site where homeless man died. Staff at The Connection Charity  said they had been helping him try to find a job and he had submitted an application form last week – hoping to become a waiter. It would appear that Jeremy Corbyn, the Labour Party and the Media have shot themselves in the foot big time since it is now being reported the homeless man had been jailed for sexually abusing a child and deported in 2014. He was again found to be in the country illegally and deported in 2016. 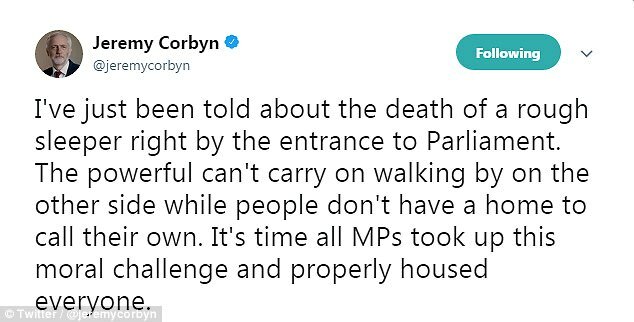 The man, was a regular at an emergency shelter run by central London homelessness charity The Connection. The question of how he managed to enter the country after being kicked out twice in 2014 and again in 2016 needs to be explained by our ‘Border Force’. The question of how he could submit a job application without a ‘National Insurance Number’ and permanent address, with the help of the The Connection Charity , needs some explanation. Additionally, why the charity has been feeding and assisting an illegal immigrant also needs some clarification. Tagged British Democrats, britishdemocrats.uk, Homeless Illegal Immigrant, Jeremy Corbyn. Brexit Talks at Chequers Concluded – What Was Agreed? Jeremy Corbyn is not the brightest spark. But one thing he does know, is that social housing is being used to ‘grease the wheels” for mass immigration. A scandalous reality. Without it, so many people from the Third World would not be here. This is the reason why we have a Housing Crisis. Labour, who openly cry their tears on behalf of people like this criminal, are only too happy to walk past a homeless native Briton, because he is not as worthy in their eyes. And what chance would he have of ever getting a flat, with so many others prioritised ahead of him ? Brilliantly summed up Daz. The man was Angolan, who went all the way from his native country to Portugal, and there he showed his true nature, so he then tries his luck in the UK, fully aware that we have our fair share of gullible fools like Comrade Corbyn and the likes of the Guardian hacks and their readers, who will put him on a pedestal because of his race. The Labour leader’s virtue signalling has backfired in spectacular style, I have read many letters to the Metro newspaper, nearly all condemning him for his shameless opportunistic motives, looks like Red Jeremy has been rumbled again!!! Jeremy Corbyn , as a Leader of a Major Political Party in OUR Country , is PERSONALLY RESPONSIBLE for this Mans DEATH. Let me explain. He Promotes MASS IMMIGRATION , knowing full well that our Country CAN NOT COPE. Hence the Death ! To encourage People here on FALSE PROMISES of a Land of Milk and Honey , has caused this Incident. Theresa May and whoever Leads those Liberal Types ARE EQUALLY RESPONSIBLE. Britain can not cope and with a DECENT , CARING ,NATIONALIST GOVERNMENT THIS JUST WOULD NOT HAPPEN AS WE WOULD NOT LET HIM IN ! HAPPY ST. DAVID’S DAY , To all our MEMBERS and SUPPORTERS and indeed ALL THE WELSH PEOPLE.